Morning rituals. Sometimes they’re just things you could literally do in your sleep, helping you get through the morning in a blind haze. And in some cases they are what you get out of bed for. Bomboloni would come under the latter category. The local coffee shop near my mother in law’s house sits in the main piazza of a sleepy town centre in Tuscany. People gather there throughout the day to chat, to take their espresso at the counter (standing up of course) or to order trays of the coffee shop’s delectable in-house pastries to take home. The older men of the town, sporting their obligatory drivers caps, like to stand or sit out the front in a huddle and stay that way for most of the day, following the sun in the winter and the shade in the summer. We go there for our morning ritual, not the everyday morning ritual but the weekend one. The coffee’s not great. It’s made with that habit of going through the motions – pushing buttons, tapping, pressing – of someone who has worked there a lifetime. But we don’t really go there for the coffee. The reason we go there is all about the bomboloni. The size of doughnut holes, these innocently small, round balls of light, sweet, fluffy dough injected with crema, that thick Italian custard, are a mouthful of perfection. Somehow, even with an imperfect cup of coffee, that bombolone makes the morning. In Melbourne, we have a different morning ritual. Coffee is always a part of it, whether it’s single origin, prepared with the care of someone who takes pride in each and every cup, or simply made on the stove top at home. On the weekends, the newspaper and a plate of perfectly poached eggs usually make an appearance. But there’s something about the bomboloni from that old fashioned sleepy bar that just doesn’t translate as well in this new setting. And believe me, we’ve tried. So I figured we could make our own. My husband insists on crema in his bomboloni, I’m quite partial to raspberry jam. We tried three different doughnut recipes before finding a winner, which unsurprisingly came out of Pellegrino Artusi’s cookbook, the ultimate of traditional Italian home cooking. Artusi doesn’t call them bomboloni, however, he – in 1890 – calls them by their original German name, krapfen. 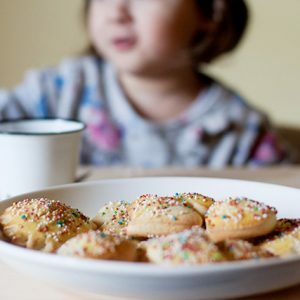 Two different krapfen recipes are included in Artusi’s cookbook; the second one is recommended for sweets. I found the recipe so good, I only adapted the preparation of the bomboloni. Artusi makes two round, flat discs and layers jam in between the discs before frying; I simply injected the bomboloni with a squirt of jam from a piping bag after frying. Place the yeast in a cup with a spoonful of the flour and a dash of the milk, warmed slightly, and set it aside in a warm place until it has doubled in size. In a mixing bowl, combine the melted butter with the egg yolks, one by one. Then add the rest of the flour, the yeast when it is ready, the salt, tablespoon of sugar and the milk, bit by bit. This is easiest, I find, to work with your hands – you want to combine the ingredients until they come together into a dough and no longer stick to the bowl. Dust the top of the dough lightly with flour, place it back in the bowl and cover with a teatowl or with plastic wrap. Set it aside somewhere warm. When the dough has risen, turn it out onto a clean, floured surface and roll it to about an inch thick. Using a small, round pastry or cookie cutter, cut rounds out of the dough and place them on a sheet of baking paper to rise again. Let the bomboloni rise in a warm place (you can cover them with a clean tea towel to protect them from drafts), then fry them in plenty of vegetable oil at about 170-180°C. When they are an even deep golden brown, immediately place the hot bomboloni in a bowl of fine caster sugar to coat them. Place them on a baking rack to cool and when cool enough to handle, pipe your favourite raspberry jam into the centres and serve immediately. When leaving the dough to rise, it’s important that they have a warm place. If it’s winter and your kitchen is cold, you can even warm up the oven a little, turn it off, then place the bowl in the warmed oven. If you don’t have a sugar syrup or oil thermometer on hand to test the temperature of the oil, throw a cube of bread into the oil – it should go golden in about 15 seconds. Any sooner, it’s too hot, any longer, it’s not hot enough. 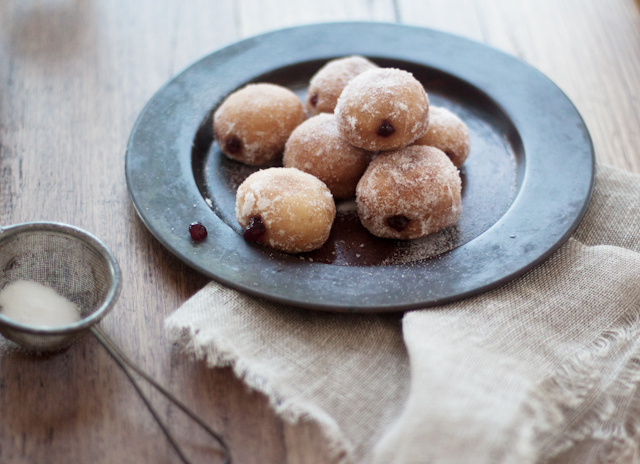 Use plenty of vegetable oil, so that the bomboloni float – you will have to flip them over just once. The bomboloni must be very hot for the sugar to stick to them evenly, so pop them straight into a bowl of sugar as soon as they come out of the hot oil from frying. 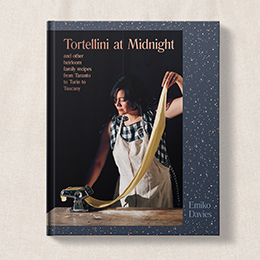 If you don’t have a piping bag, try doing this the way Artusi would have done in 1890 – by placing a teaspoon of jam on one disc of dough, moistening the edges with water and sandwiching another disc on top. These photographs were shot at White Space Studio; all props (except for espresso cup and saucer) are from prop’d (styling heaven), both in Melbourne. 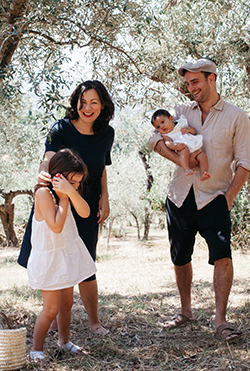 Wonderful post, Emiko! I’m always amazed by your writing. Your photos are beautiful and makes you feel at home. Thank you Zita, I could say the same thing about you! Lovely! Those look just irresistible. Your pictures are terrific, as always. I’m with your husband in that I prefer a custard filling. These look delicious and just in time for mardi gras! I do agree with Zita, it’s a pleasure every time! You perfectly described our Italian old men! I love that you wrote about this today because coincidentally, bomboloni are what I’m getting my boyfriend for Valentine’s Day! I’m not making mine though, instead I’m getting them from a place (not so cleverly) named Bomboloni. I’ve never been before but I hope they’re as good as yours look. Oh and I’m a custard girl all the way myself. Angie, that’s great! How did the bomboloni from Bomboloni turn out? I love lingering over breakfast with my husband, chatting and commenting on what’s in the news. To me, it’s even better than a romantic dinner out. I can’t wait to give the bomboloni a try. Wonderful post! These look adorable and sound utterly delicious. I will be trying these for sure. Thank you for sharing. Oh my. 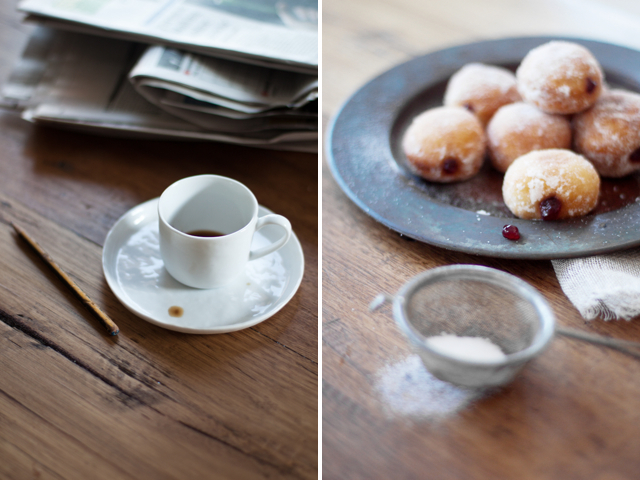 Bomboloni – my father’s favorite treat] Reading your post brought back many happy memories of sharing these with him. Mille grazie. II am enjoying your very beautiful site! Wow! This is my first visit. It is a pleasure to read, and your posts are so informative. And your photography is quite simply beyond compare. Congratulazioni! Thanks, glad you found me and hope you enjoy looking around! I have just found you and I love your writing and pictures. I have recently made bomboloni myself. I had always liked the one filled with crema but in one of my last visit on Italy (I currently live in USA), my cousin introduced me to bomboloni filled with Nutella and they were just heavenly. You should try. Thanks for stopping by – Nutella-filled bomboloni must be the most indulgent of them all! Some ricotta bomboloni recipes actually have a filling of ricotta inside the pastry, others are made with ricotta folded through the pastry (as you’re suggesting, replacing the milk). 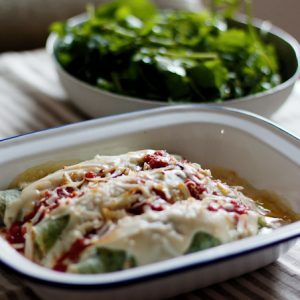 I haven’t tried it that way before but I do know it’s a common recipe – if you do try it, make sure you have a really soft ricotta, you can even pass it through a sieve a couple of times to make it smoother. hope it works out! Would these still be ok cold? If you made a lot to take to a party? They’re obviously best fresh and hot but I think they would be fine cold if they were at least made the same day (they go a little dry eaten the day after). I know that’s how these ones ended up being eaten and there were no complaints! Hi, they look amazing and very similar to mine. which mine is a very different recipe and method. i do want to try these only one question. Can I reuse the dough once I let it rest of course after I cut the first round or do you throw it away? do you use one disc per bombe or two as per Artusi’s method? You can reuse the dough. Although the original recipe describes layering jam in between two discs, I just did one and squirted jam inside with a piping bag once cooked. 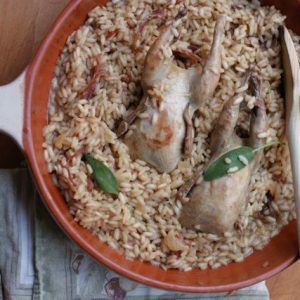 Hope you enjoy this traditional recipe, do let me know how it goes! These look so good and easy. How long do they have to rise for each time? So glad, they’re a lovely reminder of Florence for me too! Just made them last night. Followed the recipe to a T. They turned out to be beautiful and delicious. I filled them with homemade blueberry jam instead. The added bonus was that the house still smells divine from last night’s cooking. Wow. 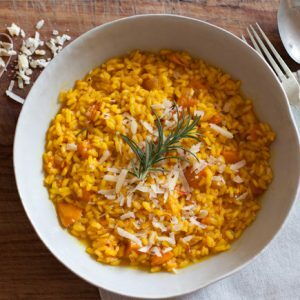 Thank you for taking the time and and for bringing these wonderful recipes to life for us. That’s wonderful to know, thanks for the feedback! 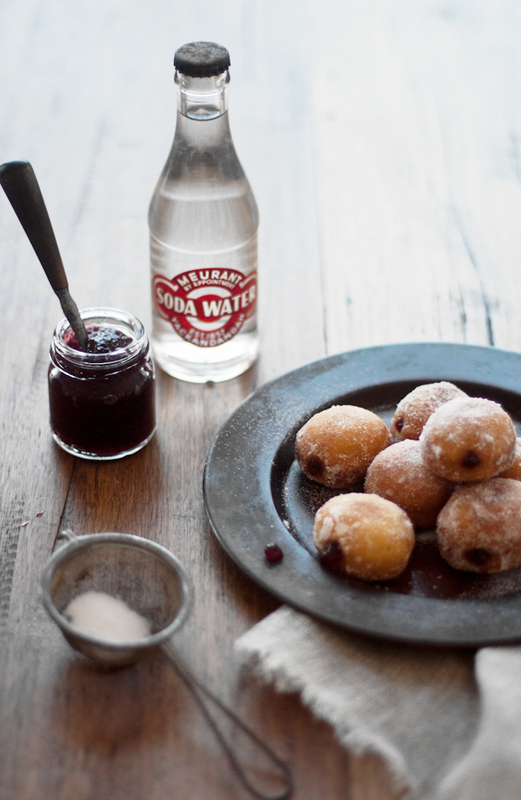 Blueberry jam with these bomboloni sounds gorgeous!